Just before the NBA season tips off, Nike will be representing both the East Coast and West Coast once again with a new Air Max 95. 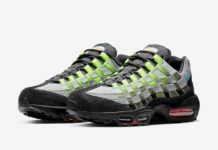 This Nike Air Max 95 features a Black upper built with leather, mesh, and suede highlighted with colors on the tongue logo, eyelets, and shoelaces. Lakers’ Purple and Gold dresses the right shoe, while the Knicks’ Orange and Blue accents are used on the left. Mismatched Air Max bubbles and a set of five shoelaces completes the design. No word yet on a release date, but you can expect this Nike Air Max 95 Premium “LA/NYC” to release in the coming weeks at select Nike Sportswear retailers and Nike.com.